I love flying – the acceleration of the take off, watching the world disappear below you, a couple of drinks, a bit of lunch and the thrill of coming in to land at a new destination. But one thing Boeing and Airbus don’t usually offer airlines as an optional extra is to cut a whopping great hole in the side of the plane so people can throw themselves out of it. Besides, who would want to? I mean, it’s a long way up, and falling from such a great height would be ridiculous, right? 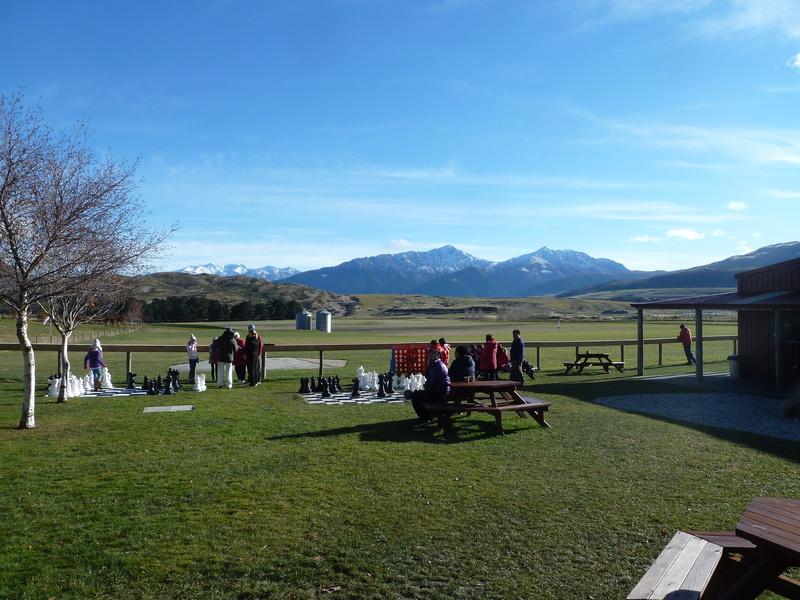 Once again, Queenstown has got hold of me. It seems just about anyone on the backpacking and travelling circuit, be them the barely-20 gap year students, the 30-something career-break grafters or those who,somehow, have just found themselves on the other side of the world, have managed to get a photo of themselves plummeting towards earth from a plane. It’s almost become a rite of passage for anyone spending a long period of time overseas, as if passport control at Heathrow won’t let anyone back into the UK unless their Facebook profile picture shows them attached to a parachute. I’m even beginning to wonder if British Airways will start introducing a warning not to jump out of the doors as part of the pre-flight safety briefing before long, such is the number of people who are members of the skydive club over here. Its easy to see why, especially around Australia and New Zealand, with an almost endless number of companies set up to take the paying public up in the skies, only to throw them out of an aircraft. 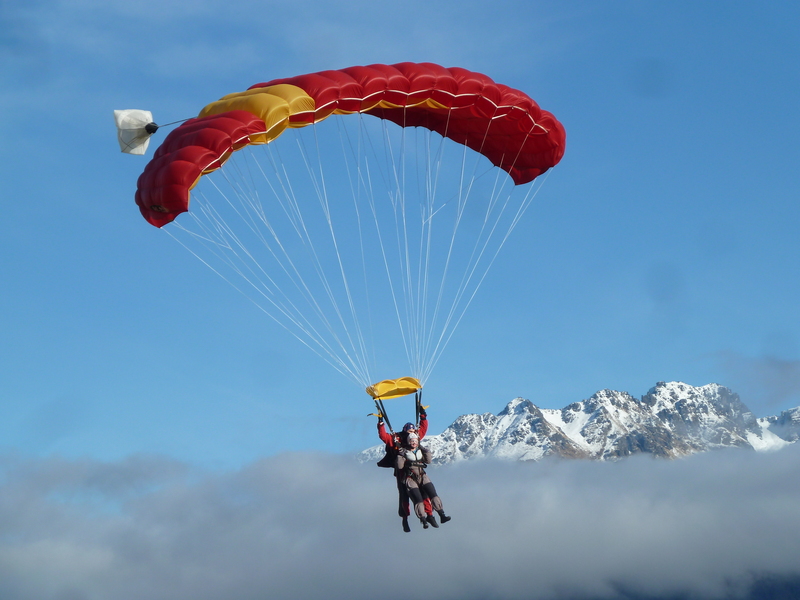 I must admit, a skydive is one of those things that I had on my ‘to do’ list. 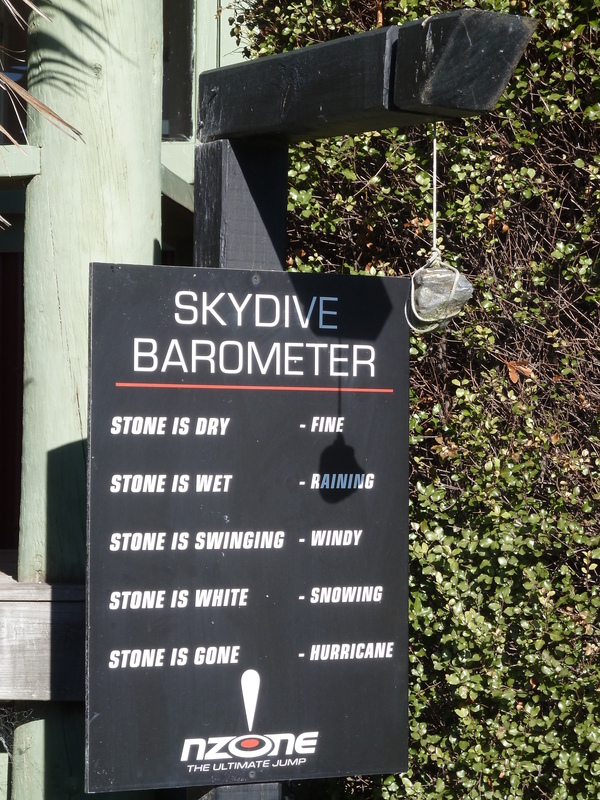 Unlike the bungy jump, which I always said I would leave well alone- until this week anyway – dropping like a stone from an aeroplane did strangely appeal to me. 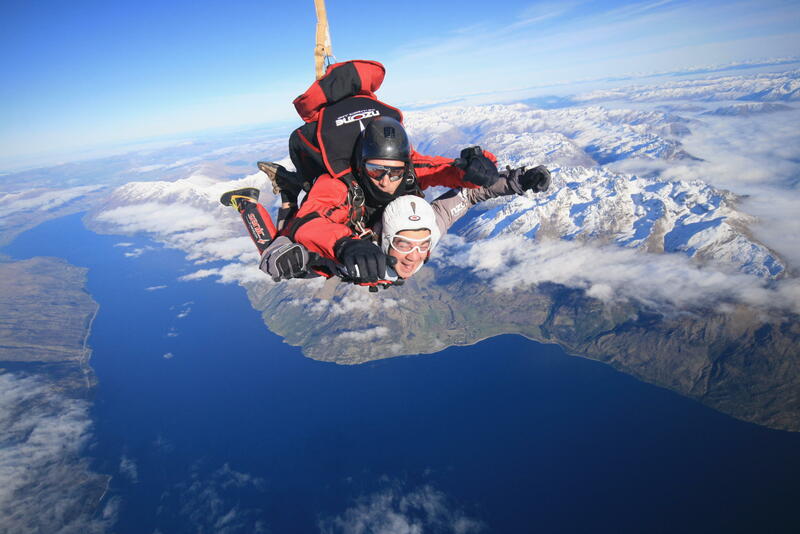 And when you’re surrounded by snow capped mountains, a huge, beautifully dark blue lake, alpine forest and scenery to die for, the urge to see Queenstown from above – suspended below a sheet of space-age material – takes over. 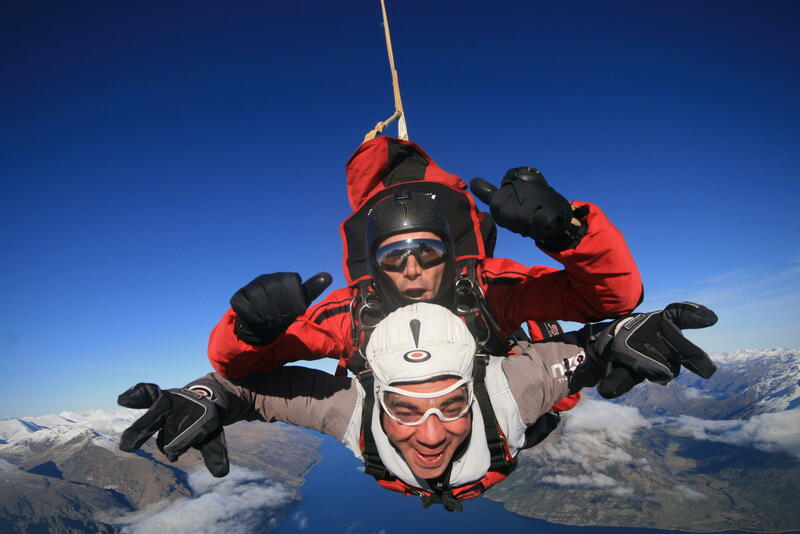 And who better than one of the industry leaders, who have been in the skydiving business longer than any other in Queenstown, to be the ones to take you up to 15,000 feet before sending you on the express route back to the ground. 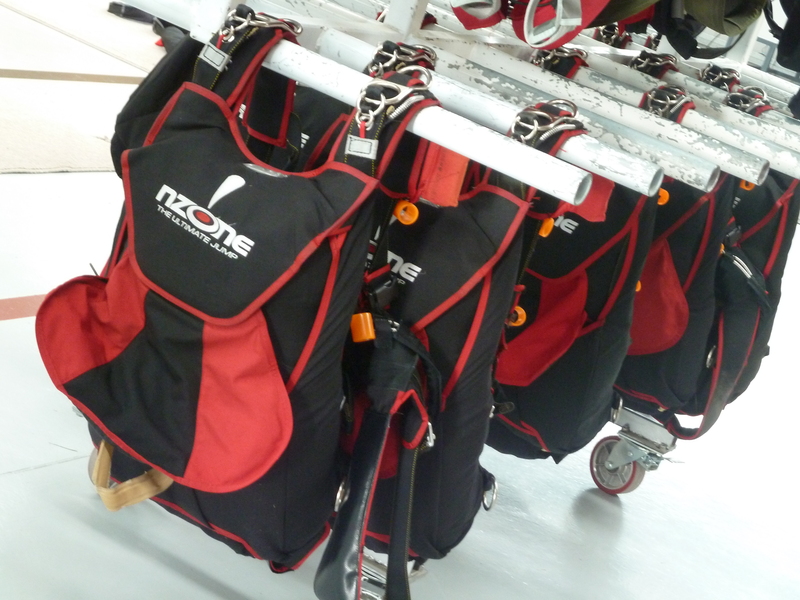 Nzone boasts an impeccable safety record, going above and beyond all statutory industry regulations when it comes to those who take your pictures and strap themselves to you while you fall back to Earth. It was peace of mind for me. Its natural to be afraid, and as I arrived at the drop zone, a short drive from the main town, I could feel the nerves starting to build. 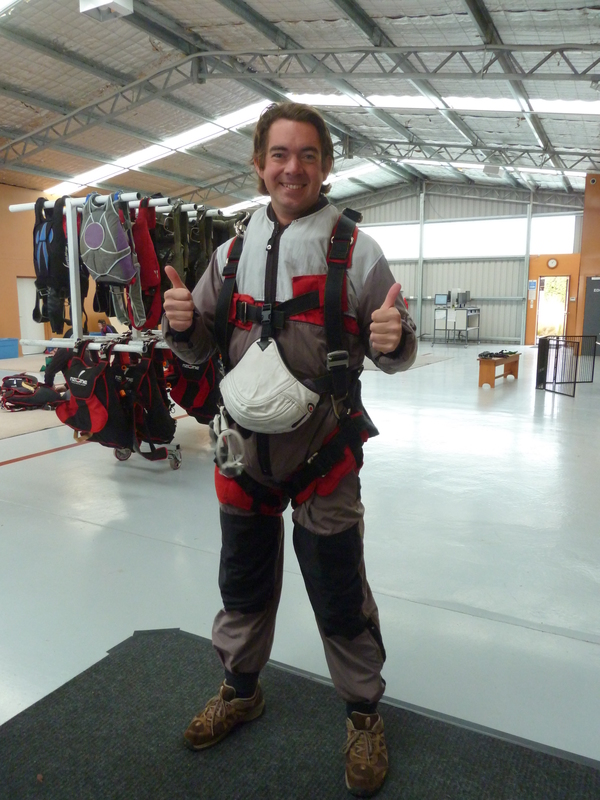 I’d had some time to get my head around the fact I was about to jump from an aircraft, but hearing one of the staff say ‘right, are you all ready to jump out of a plane,’ really does make you wake up and smell the coffee. And when you see the aircraft sitting there, waiting to whisk you up beyond the clouds, it suddenly all feels very real. Speaking of clouds, they are a bit of a problem when it comes to this daredevil activity – I was actually booked to make my jump yesterday, but the whole area was plagued by low-level cloud and poor visibility. It’s one thing making a jump and landing on a target site, its another thing if you can’t actually see where you’re aiming for. Thankfully, the clouds were breaking up and promising to clear for the latter part of the morning. I was met by Flip, real name Philippa Collins, who it turns out used to be the early breakfast presenter on Capital FM, as well as a continuity announcer for Sky One. We suddenly went into ‘media’ chat about who we might know in the industry, as it turns out Philippa has also worked for a large number of local stations. She told me how she moved here five years ago, fell in love with New Zealand and has now settled, even gaining citizenship. “Sometimes I do a bit of voice work here and get behind the microphone and miss it, but then I know that I love the life I have here,” she says. 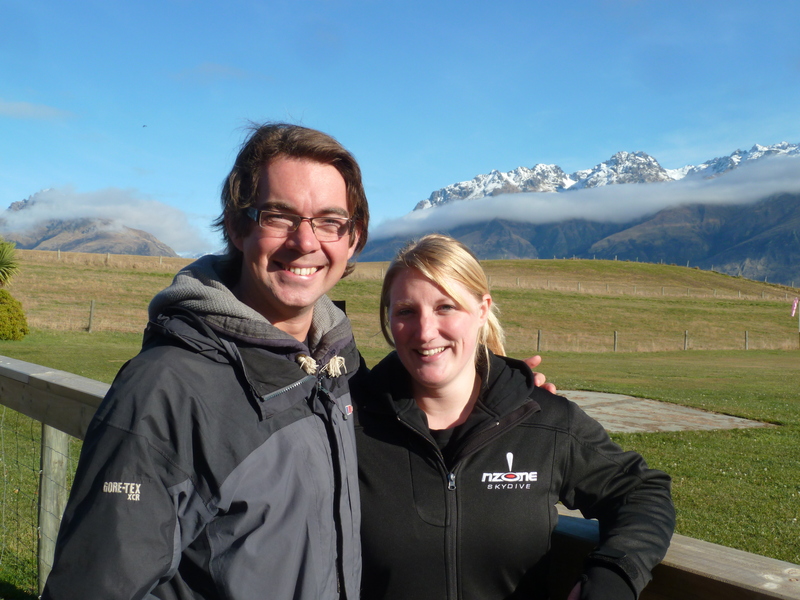 And one of the things she loves, aside from the fresh air, stunning mountain backdrop and a fun-filled lifestyle, is seeing up to 200 people a day drop out of a plane high above the Nzone offices. 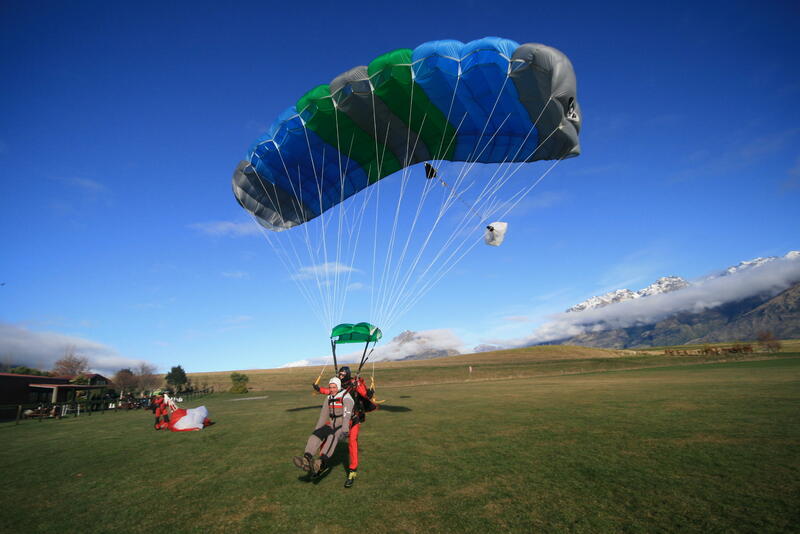 With the first group up – and very quickly down – Flip ushers me into the parachute packing area, where I’m kitted up with the jump suit, gloves and hat. The outstretched hand from the tall, smiling and relaxed guy, dressed in his bright red jump suit and very much the calming influence I needed, helped to relax me. 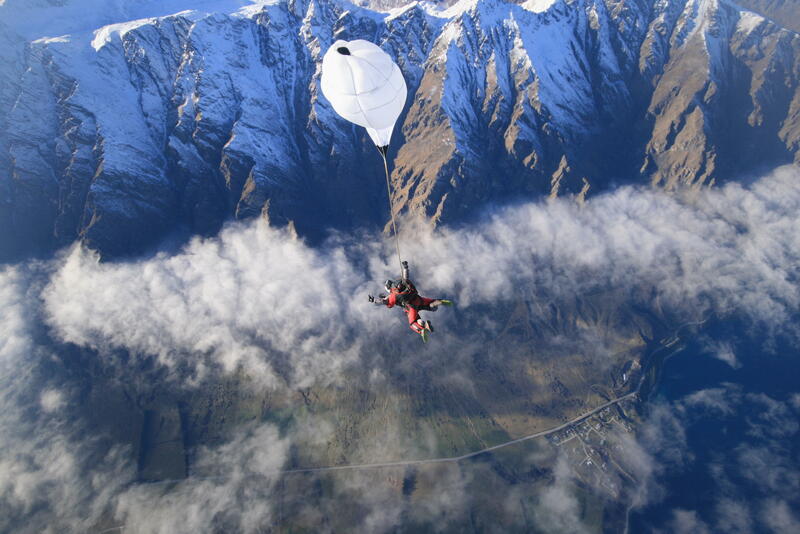 Mira – short for Miraslav – is from the Czech Republic, and has been jumping from planes for around nine years. Its enough to reassure me I’m in safe hands. “Right, you need to make yourself into a banana,” is the advice from the pre-flight briefing. I run through it in my head. I’m sure that when I’m dropping through the sky, it will all fall into place, but I practice just to be sure. By now, the cloud is clearing by the minute, and the sun is breaking through more and more. I’m glad – while it feels like I’m about to put my life on the line, at least the scenery will be good to look at. With a final check of my harness, a group of us are walked to the aircraft. It’s a Cessna Grand Caravan, known as a Supervan 900, specially made for skydiving. 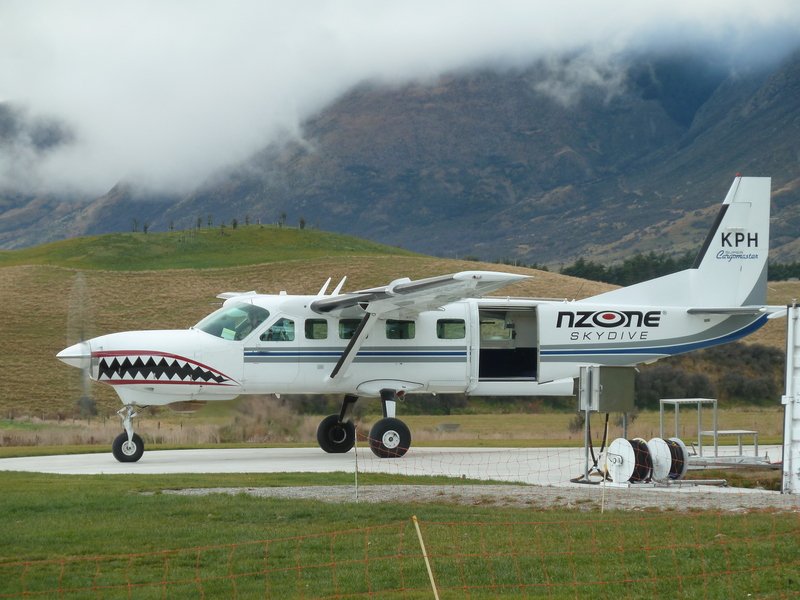 It’s a turboprop capable of climbing really high, really quickly – around 4,000ft a minute to be precise – and you can get a fair few people in there. 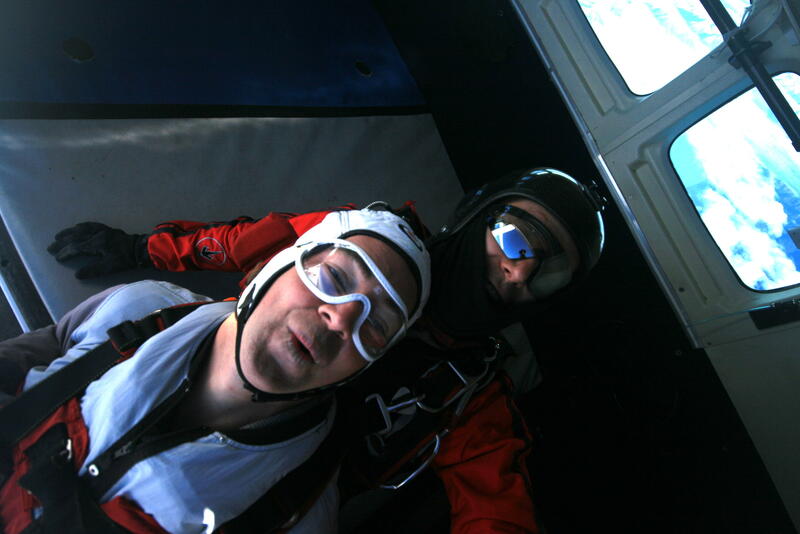 Among them, a few people who are to jump from 12,000 feet, before we continue the ascent to our 15,000ft altitude. Comedy dance routines couldn’t be further from my mind as I watched the see-through door being rolled down over the opening in the fuselage. My one escape route to terra firma had been closed off – there was no going back. I could feel Mira adjusting the buckles and straps on my harness, double checking it was attached properly. I’m facing the back of the aircraft, but just behind me I could hear the pilot talking about the drop site. “We’d like a one mile warning,” came a call from one of the tandem instructors. In front of me, my cameraman for the next half an hour was getting waves and smiles from me. I sense the engine noise increasing, and feel as the wheels begin rolling along the grass. This is it – the next time I have my feet on solid ground, I will have fallen to it from a plane. 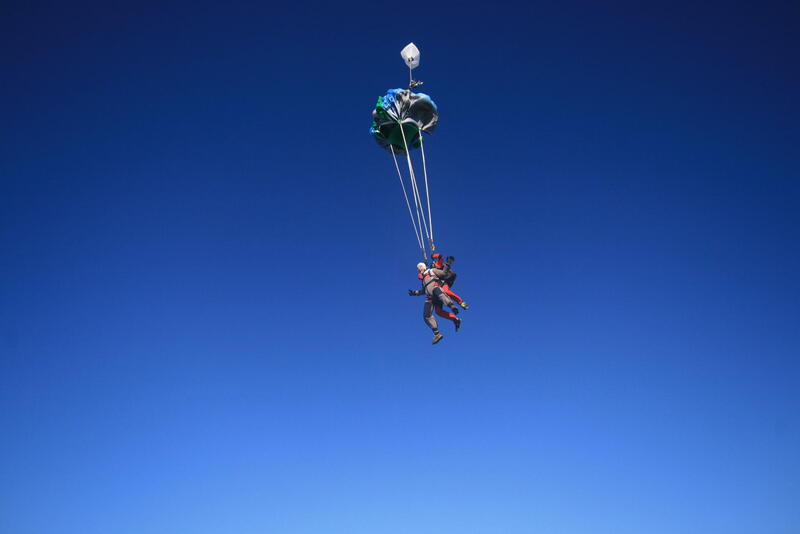 Grab a parachute, we’re off! I look outside the window and watch as a grassy bank starts passing faster and faster. The turboprop engine reaches a scream just a couple of metres away, powering us up into the air. My cameraman captures the moment. Mira pats me on the shoulder and shows me his altimetre, indicating how far we have already climbed into the sky. 2,000ft already, and we’ve only just left the ground. I can feel my nerves building, and look around the aircraft. There are similar nervous smiles all around from the rest of my group booked onto the flight. The tandem instructors are clearly in their element, looking forward to what for them is the day job. 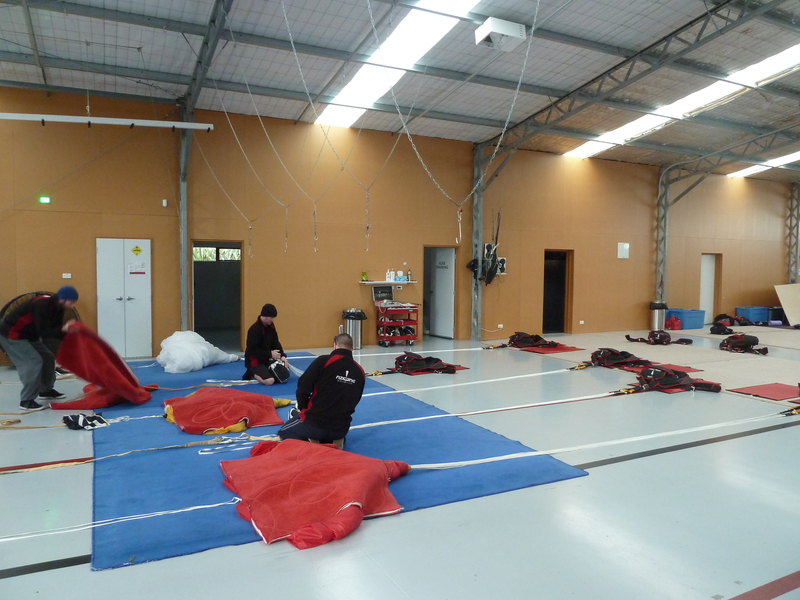 Up towards the back of the plane, the first jumpers are putting on their hats and goggles in readiness. Outside, the wings have been surrounded by mountains, the brilliant white snow that has topped them in recent days and weeks gliding alongside us. I can’t help but smile at the most incredible scenery I am flying through. 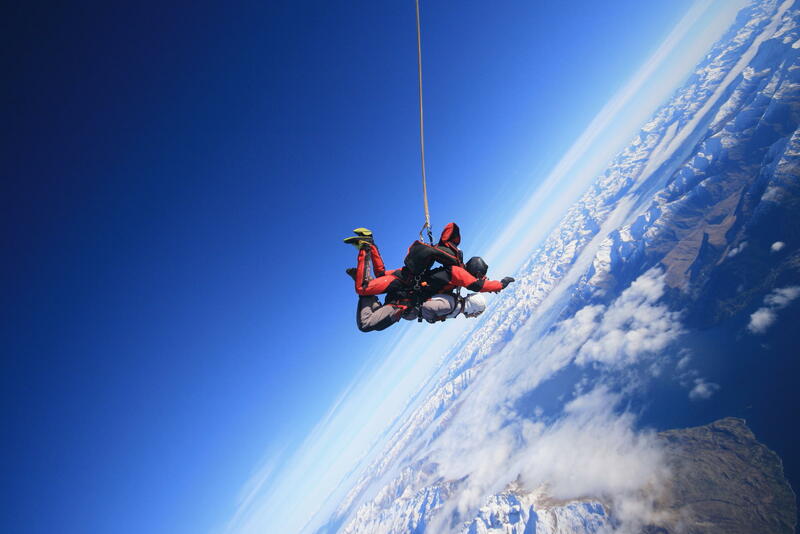 “We’re just coming up to 12,000ft, so the first jumpers are about to go,” says Mira in my ear and showing me his altitude gadget on his wrist. We level out and the throttle to the engine is cut. It feels like we’re floating compared to the high-powered, rapid ascent we’ve just made from the ground. The see-through door is pulled open, filling the cabin with noise and wind that blows across our faces. The first jumper shuffles her way to the door, and within seconds, she and her instructor have disappeared. The next one shuffles along the floor. Another girl begins to scream as it dawns on her that she’s about to move towards the door. I watch as the next jumper has her head pulled back into her instructor’s shoulder, and in an instant, they’re gone. There’s a part of me that’s horrified at how quickly they disappear. It doesn’t quite feel right to watch two people vanish through an open door in an aircraft like that. 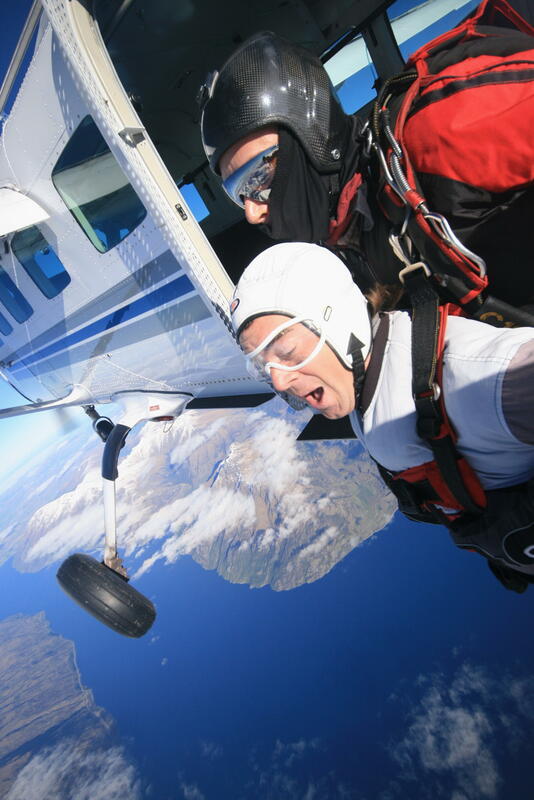 There’s more screams from the final 12k jumper as her feet dangle over the edge of the plane. I hear someone tell her to keep her head back. A few more nervous screams, and then silence. The door closes. The first jumpers have gone. The throttle increases again and we begin climbing further. I’m told to put my hat and goggles on. I feel my teeth start chattering – I can’t make out whether its nerves or the cold that’s causing it. I can feel the effects of the thin air on my breathing, as the reduced oxygen levels this high up force me to take deeper breaths. Mira tries to calm me, sensing my nerves. “Deep breaths will relax your body,” he says, before motioning me to move forward. I look outside – it’s the sort of view you normally get high up on an airliner. We’re reaching 15,000ft, about half the cruising altitude of your holiday flight to Spain. And it looks like it. 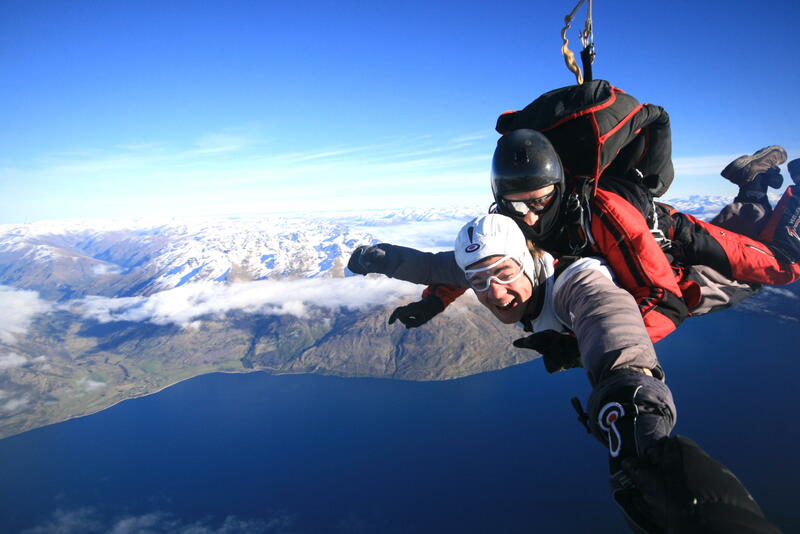 New Zealand’s south island sprawls out below, Lake Wakatipu dominating the view. The mountains that towered above me just a few minutes ago now look like ripples on the land, the town of Queenstown a small patch of grey buildings. Inside, the photographers and instructors are all high-fiving each other, wishing each other well for their dives. I’m encouraged to join in. I can feel the butterflies in the pit of my stomach. I keep telling myself its safe, but for the second time in a week, my body is starting to fight against the human instinct of survival. Except this time I am not in control. 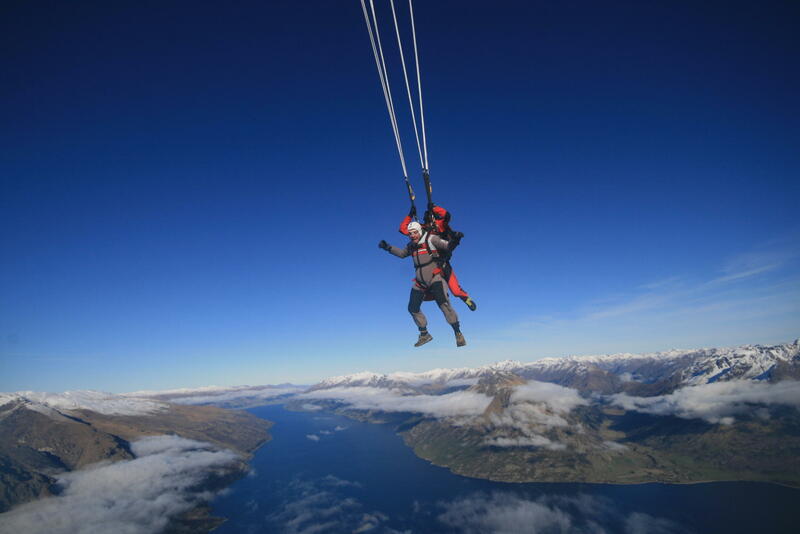 When it came to the bungy, it was my decision when to leap. I was petrified. Today, my life is in someone else’s hands – they have a back-up parachute, years of experience and a calming personality, but this is still a daunting challenge. Why am I about to do this? I’m in a perfectly good plane, one with wings, an engine and wheels that in a few minutes will be safely back on the ground. There’s an element of risk, a danger, a slight chance that I could be that one freak statistic of when it all went wrong. And then I think back to some very wise words I spotted in the Nzone office. The door opens. The green light beside it can mean only one thing. The rest of the group disappears into the bright blue sky beyond. I’m the last one onboard the plane to go. Life on the edge…of a plane! They were the last words from Mira as he shuffles me forwards. My cameraman has performed some kind of Spiderman act and stuck himself to the side of the aircraft, the cameras recording my once-in-a-lifetime moment sticking up from the top of his helmet. Being harnessed to Mira in front means I’m the one who has to stick my legs outside first. And then I get to look straight down. It’s a long way up. A very long way up. And it’s a perspective that I have never seen before. Try as you might on an airliner, you can never look straight down at the ground, nomatter how hard you squash your head against the window. Mira moves forward and I’m positioned right on the edge. A quick photo, and then there’s a couple of pushes from behind. Its Mira leaning forward on his count. And then we tumble out. For a split second I feel a falling sensation before realising I’m out of the aircraft. My eyes are filled with the deep blues, greens and browns of the landscape below me, while the dazzling whites of the clouds and mountain tops are bright to look at. I lose my bearings and have no idea which way I’m pointing. The realisation that there is nothing below me is an odd one – it feels so unnatural. In a strange way, it almost feels as if I’m laying on a huge scenic canvas below. The wind howls around my body as our speed towards it continues to pick up. I feel it lifting my goggles slightly, blowing around my eyes. For a second or two, its hard to keep them open. Just 12 seconds after dropping like a stone from the aircraft, we’re travelling at 200km/hr – 125mph – yet it hardly feels like I’m moving. I know I am, the deafening noise and forces I’m feeling confirm it, yet we’ve reached the moment where the force of gravity is balanced out by the drag of our bodies falling through the air. Our acceleration has stopped. For the first time in my life, I’ve reached terminal velocity. We stabilise, and already the plane we’ve just left is well out of sight. My cameraman suddenly appears and I try to give a smile. Its pretty hard to focus with so much going on, so much to look at and so much to savour. The cameraman holds out his hand, reaching out for mine. I grab it and link fingers for a few seconds, before he glides away again. Mira somehow turns us around and we try again, this time getting hold of each other. We start spinning around, and I start laughing. This is incredible. We loop around each other again, dancing around in the beautiful blue sky. We’re laughing in the face of gravity, every bit of fear and self-preservation urge in my body has been proved wrong so far. Suddenly, it goes silent. I’m yanked hard upwards as Mira releases our parachute, quickly killing our speed. As quickly as the freefall started, it seemed to be over, yet somehow we’d been falling like a stone for 60 seconds through around 10,000ft. The Remarkables mountains are once again alongside me as we sail around in the air, looking around and enjoying the view. I’m laughing again at how fantastic the experience is. “And so this is your office?” I ask Mira. “Yes, yes it is,” he replies, clearly happy with the view from his window. Below me, the colourful parachute canopies of those jumpers who left the plane moments before me drift around in circles. The brown-roofed buildings of the Nzone offices are growing ever nearer as I try to take in as much of the view as I can. I’m struggling to hear much though, aside from squeaks and clicks in my ears as they struggle to deal with the rapid change in pressure. It borders on painful, but the adrenalin coursing through my veins helps to keep it bearable. “Keep your feet and legs up when we come into land,” Mira tells me, getting me to practice as we drift around the landing site. We turn right and make our final approach to the grassy area and watch as the fence disappears underneath me. I listen to the wind as it ripples through the canopy above us and hold my feet up as we head towards the ground, waiting for a bump that never arrives – it was a perfect landing. Considering the incredible speeds of just a couple of minutes ago, the height we’ve dropped and the rate of descent, we touched down on the grass with about as much impact as a feather. Beautiful. Mira unclips himself from me. I stand up knowing I’ve got a huge smile on my face. I shake his hand and give him a manly hug for getting me down safely and in one piece. He’s already gathering his parachute back up in readiness for his next jump. I’m already envious. I looked up at the sky. 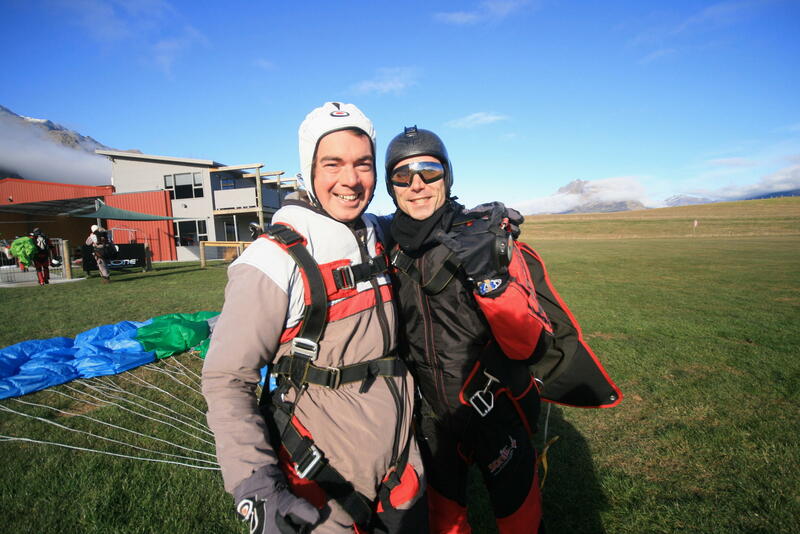 The clouds had cleared and the day had turned into perfect conditions for skydiving. Another group of people were walking out to an aircraft, about to experience the same heady mix of excitement, fear, acceleration and serenity within the space of just a few minutes. A trip to terminal velocity, to the fine line that divides life from death, to the boundaries of the human mind and to the instinct that tells you ‘don’t do it’. Amid all that is an unbelievable rush, an underlying urge to push mind over matter, a thrill that only a select few people will ever experience. 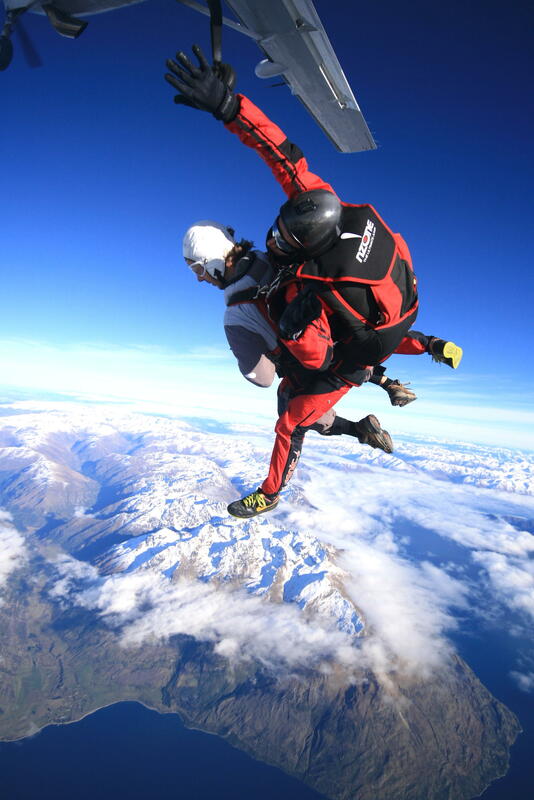 Those who have skydived. As the company says here, there is no such word as try – there is only do, or did not do. Embrace the fear, Nzone suggests. I’m glad I did. 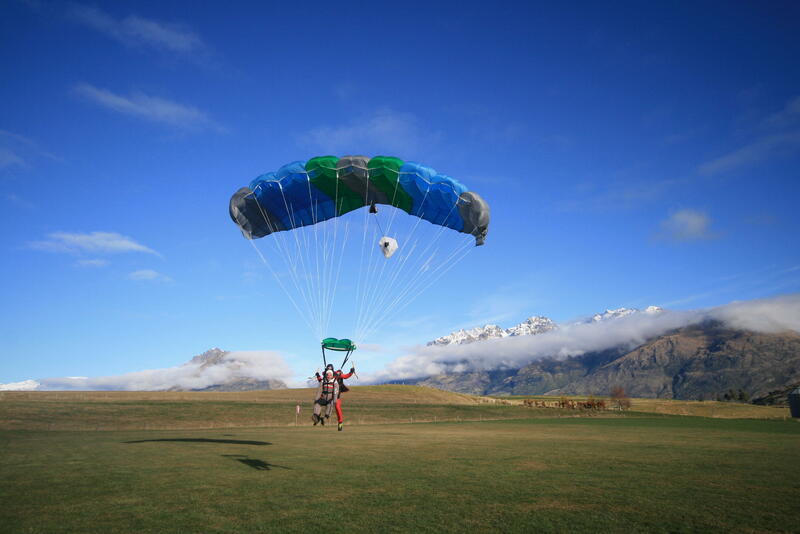 This entry was posted in Backpacking, New Zealand, Skydiving, Travel and tagged afishoutofgrimsby, backpacking, New Zealand, nzone, phillip norton, queenstown, skydive, skydiving, terminal velocity, travel, travelling by afishoutofgrimsby. Bookmark the permalink.